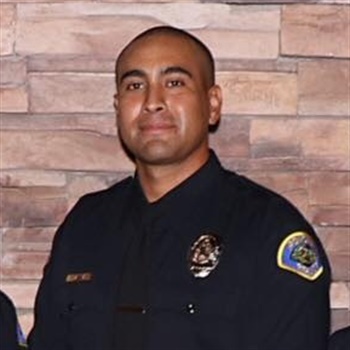 Pomona, CA, Police Officer Greggory Casillas was fatally shot during his last field training shift before he could finally ride solo. During that Friday shift, a reckless driver led officers on a pursuit that ended with a crash. Casillas, 30, followed the driver into a Pomona apartment complex, where the man was barricaded in one of the units. As Casillas approached, he was struck by bullets fired from behind a door. He was taken to a hospital, where he died. More than 300 mourners gathered outside Pomona police headquarters Sunday night for a candlelight vigil, where officers wore black mourning bands with the number "16" — Casillas' badge number — over their badges, reports the Los Angeles Times. "Losing Gregg has ripped a hole in the hearts of his family and members of this department," Pomona Police Chief Michael Olivieri said at the vigil. Colleagues remembered the 6-foot-4 Casillas as a gentle giant, a hard worker who loved to joke around with and motivate his co-workers. A father of two small children, he was just starting to build a family with his wife, they said. "It was his dream to be a police officer," said Dawn Coday, a senior records specialist with the department. "It was happening, his dream was just beginning." Isaias De Jesus Valencia, 39, has been charged with murder in connection with Casillas' death and the wounding of another officer who tried to rescue him, the Los Angeles County Sheriff's Department said Sunday, reports CNN. The man was also charged with attempted murder of other peace officers, the agency said in a statement.